The book of 2nd kings 6: 24 -30 tells the story of an extreme situation that was going on in Samaria at the time. Benhadad the king of Syrians gathered all his army and besieged the Samarians until there was famine in the land. There was the entire army of Syria on one hand and extreme famine on the other hand, it was a terrible situation in Israel. It is just the way sometimes we look around our circumstances and we wonder how things have gotten this bad. You can get into a period of siege in your life where it seems like the question of “why should i wait for the Lord any longer”? just buffets your mind even when you have told God that ‘Lord I am your son and your daughter, nothing will separate me from your love.’ But there are situations and circumstances you get to in life and it seems like this question assaults your mind. In Chapter7:3…Elisha said hear the voice of the Lord, by this time tomorrow….Just the same way that sometimes it seems like you are struggling and just getting by a dead end job and then God suddenly said to you ‘behold something awesome is coming your way, something mighty is coming your way’ and you begging to feel like Gideon. But let me tell you; when its a season of acceleration, God does not consult with where you have been, God does not consult with the prevailing circumstances around you all He wants you to do is take a hold of His words and run with it. In 2nd Kings 7:2….the man on whose arms the king leaned answered the man of God and said if the Lord will make windows in heaven could this thing be and the man of God replied him that ‘you shall see with your eyes but you will not eat of it’. This will not be our portion in Jesus Name. Those things that the Lord will show you, not only will your eyes see it, your hand will take hold of it and you will eat of it.The story goes on to tell us about how there were these lepers sitting at the gate and were having this discussion amongst themselves that why were they sitting there. In those days; the lepers are not allowed to live among the people they were consistently on the outside. So they were stuck at the gate and were having in this discussion 2nd Kings 7:3….and so they decided to go to the camp of the Syrian. The first thing we take out of that story is that God can use anyone to deliver victor. There are times we are tempted to imagine that if God was to deliver the whole nation, it will have to be from someone who looked qualified, who talks and walks in a certain way. But God can use anyone or anything and His ways are not our way. He used four lepers in this situation against all odds. The financial experts and analyst would have said it is impossible. But it was a season of acceleration for them and it is a season of acceleration for you! Some things just defile logic but when God gets in the mix and His word has gone forth; it just changes the dynamics of things. There is a kind of acceleration in your life that will beat every word; it will defile words for you. 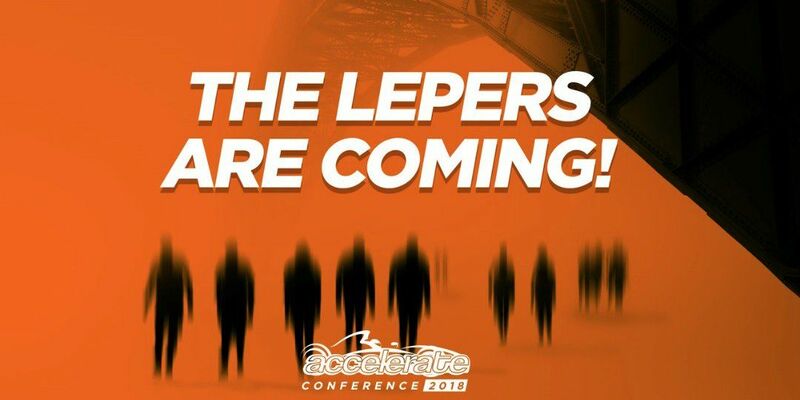 Do you know that there is nothing like acceleration from the Lord! The labour of man is good, but grace is better! When the grace and the favour of God comes upon you and His word settles on what you do; you will begin to see that it is not by power or by might. When the Spirit of the Lord says that it is time to run, when it is time for you to run; you will overtake chariots. It does not matter who had gone ahead of you, when it is your season to accelerate; it is simply your time and that is exactly what happened to them in Israel. There is a season for logic, but there is a season where you just put that logic aside and say Lord what you said is strong enough for me, i will step out of my boat just like Peter did and walk upon the waves that wanted to drown me simply because your word came for me. To stay where they are where nothing is happening: You might have been afraid of starting a business or launch out on what God told you to do because you are afraid of ‘what if ‘What if it does not succeed, what if it does not make head way’. But God is telling you ‘Go forward’ ‘Move forward. Sometimes we stay stuck in a relationship that is not moving forward simply because we are afraid to venture out and trust God for something better. When God says it is your season of acceleration; even those things that seems impossible, that seems beyond your reach, He will deliver them into your hands. So it is important for us to recognise the dead ends in our lives and not to be afraid to walk away, trusting that God is able to lead you, direct you and settle you! To go back to the city where there is famine: Don’t go to a place where God is not present. People will come and try to suggest to you all kinds of means of how you can break through and if you are not discerning you may just be carried away by some of their stories. Don’t go to where God is not present so that you don’t walk into a siege. Their third choice was to go into the camp of the Syrians: It is important to know where God is leading you in the face of challenge. Light is a capacity for full speed, light empowers acceleration. The reason it seems for someone that the year is moving so slow is because you have not pressed in to see what the light of God’s word is saying concerning your situation. You have consulted everyone else except God. In order to accelerate, you must not only pursue light, you must love light. When God is leading us in triumphant possession He assumes we are following 2nd Corinthians 2:14. To enjoy the supernatural, sometimes it requires us to stop thinking. As crucial as thinking is; there will be season in your life when God will ask you to do illogical things to see His salvation. John 6:19 tells us a story about Peter and the other disciples in the boat; there was a turbulent storm and they look up and saw Jesus walking on the waves of the water and Peter ask ‘if this is you, bid me to come’ and Jesus said ‘come’. What is that safety net that is around you and you are unwilling to step out from and trust God to move you beyond. Do not esteem your intellect above divine instruction! Declaration: “I will step out of the place of familiarity, I will step out of the place of complacency, I will step out of my comfort zone and Jesus if you tell me to come, I will come because you are a God of possibilities, I will stop seeing the waves and will come at your instructions”. There are all kings of sieges; Ezekiel 4:1-2 describes different situations of sieges: A wall in a siege situation is a line that says you cannot progress beyond this point. A wall is designed to either keep people in or keep people out. When the children of Israel were approaching Jericho to a land God has promised them, they met with this wall of Jericho that told them you cannot progress beyond this place. I don’t know if perhaps on your job, it just seems like you are facing this wall or you are not enjoying situations around you because it seems like however much you try to move forward there is just this wall standing in the way. Perhaps the siege you are going through is some kind of barricades, mountains of oppositions, a seemingly in surmounting obstacles standing in your way. I want to declare to you that the siege is over! The Lord is sending His word to you that the siege is over. There is also a kind of siege that Job went through, where one calamity seems to role into the next calamity. I don’t know which of these sieges seems to describe something or an aspect of what you may be going through but I believe that God is speaking to you, God is sending a word of capacitation, God is saying; it is time to move, arise and shine for your light is come and His glory is risen upon you. God is saying this is the season and time. Rise up and declare Gods word’s against all odds. It does not matter what you have been called before now or what the limitation was, the lepers was coming but it was the might army of the host of heaven going ahead of them and brought victory for them on that day! AMEN!